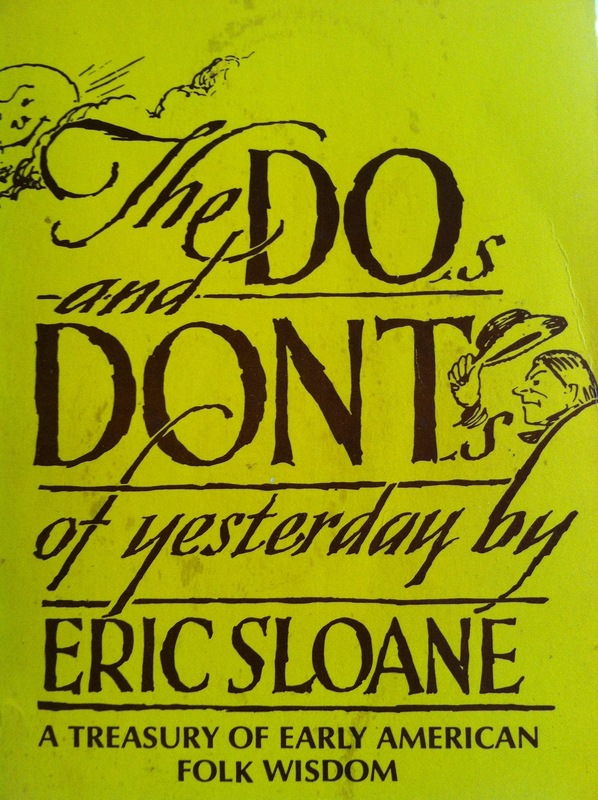 I recently picked up a 1st edition copy The Do’s and Dont’s of Yesterday by Eric Sloane at a flea market for a buck. I have always been a huge admirer of his writing and his amazing paintings and illustrations of the american landscape and the folklore that created it. His work has always spoke to me. For as long a s I can remember I have enamored with barns. The massive shapes, the intricate joinery, their varied uses. Truly one of the most beautiful and honest forms of architecture. Eric Sloane chronicles so much from the working past of our country, through his art of barns, tools and anecdotes. In this book, he highlights the latter. While this book is a quick read and more of a coffee table book, I thought it would be fun to share some of the Do’s and Dont’s as they pertain to woodworking. As the sub title suggests, they really are a Treasury of Early American Folk Wisdom. Enjoy. 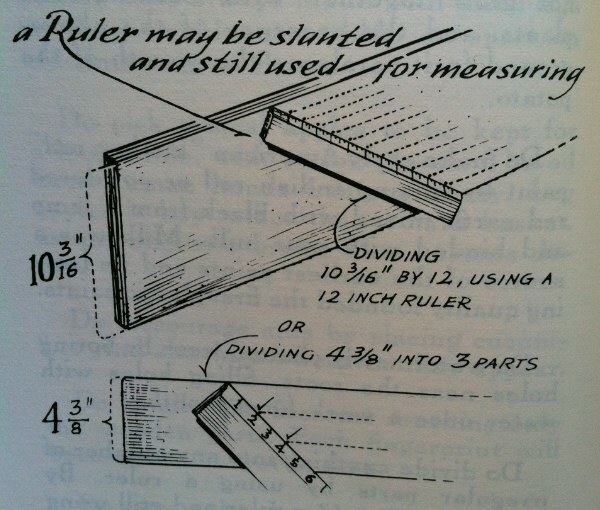 Do divide anything into any number of parts by using a ruler. By simply slanting your ruler and still using the inch measurements, you can get even more accurate measurements than using arithmetic. For example, it seems difficult to divide a board ten and three-sixteeenths wide into six parts. But by slanting a one-foot ruler from one side of the board to the other, and then dividing the twelve-inch ruler into six parts, you solve the problem without arithmetic. This entry was posted in Inspiration, The Do's and Dont's of Yesterday by Eric Sloane and tagged eric sloane by Christopher Landy. Bookmark the permalink. What a great find, he is one of my favorites, and the example you posted is right in line with the “By hand and By Eye” stuff George Walker and Jim Tolpin have been reviving, and which I have been studying recently. I feel so stupid that I’ve never thought about the method 🙂 But that’s why such books are so worthy.